As of today, fairtrade products can be found in almost any grocery store. Both, sales volume and variety of products available keep increasing at a fast pace. Much has been discussed about the certification instruments and the concept behind the fairtrade movement. However, cases discussing the business models of fairtrade initiatives are rare. 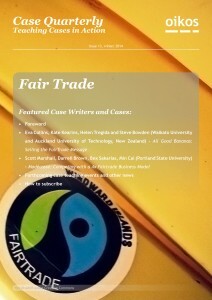 We hereby present two cases to help explore the challenges fairtrade organizations face in their operations. We are convinced they will proof as an excellent tool for students to better understand some of the key aspects characterizing the fairtrade movement.